28 years ago, a small group of adoptive parents recognized that in order to support the development of healthy identity in their adopted children, they needed to strengthen the connection between their children and their birth cultures. They also realized that part of building healthy identity in adoptees meant that kids needed to be with other families just like theirs. 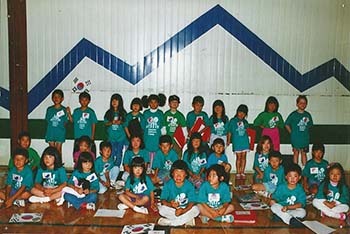 While it was valuable to attend events in their community, like Lunar New Year or Diwali celebrations, they knew their children would benefit from a camp specifically created for transracial/transcultural adoptees. HCAF has always been a family camp. From the very beginning, we knew that in order to strengthen adoptive families, parents and non-adopted siblings needed to be actively involved. Unlike other camps, parents don’t just write a check for camp and drop their kids off to “do camp;” the children see their parents are there to learn and grow, they are dedicated to building relationships with other adoptive families, they are eager to help by coordinating lunch or unloading supplies, they are willing to step outside their comfort zone and try something new. Camp is a family experience because it is about family. From the beginning, Heritage Camps for Adoptive Families strived to have cultural community members teaching the children. That set us apart from other camps where adoptive parents taught most of the workshops. Over the years our cultural community has become involved in the early stages of camp planning, and therefore provide even more authenticity in our programming. We continue to encourage adoptive parents to be deeply involved with camp – planning activities, and serving as camp coordinators and volunteers — with important guidance and leadership from adult adoptees and cultural community members who are members of our Board of Directors and Advisory Board. About 10 years ago, we started to hear from parents who urged us to create a camp specifically for families with children adopted domestically. Many of them were already attending HCAF because of their other children who were adopted internationally. They emphasized that so much of our adult programming had been an essential resource in navigating challenges; workshops on healthy attachment, identity development in the teen years, or advocating for your child at school, all provided tools and resources they referred to throughout the year. They saw that our signature programs, like HeART Talks and This Is Me, gave their kids the language and understanding to talk about adoption. As a result, Domestic Adoption Camp was created. Today we strive to honor the complexities that are part of adoption: the connection and the loss; the unique experiences of transracial/transcultural adoptive families related to identity; honoring adoptive families and birth/first families. We continue to focus on centering adoptee voices, and know that this is an essential part of empowering adoptees. We are listening to and learning from folks of color, who provide White adoptive parents with a critical perspective and understanding. 28 years later, at Heritage Camps for Adoptive Families, we are still growing and learning, and strengthening the connections that matter the most. Will you join us?